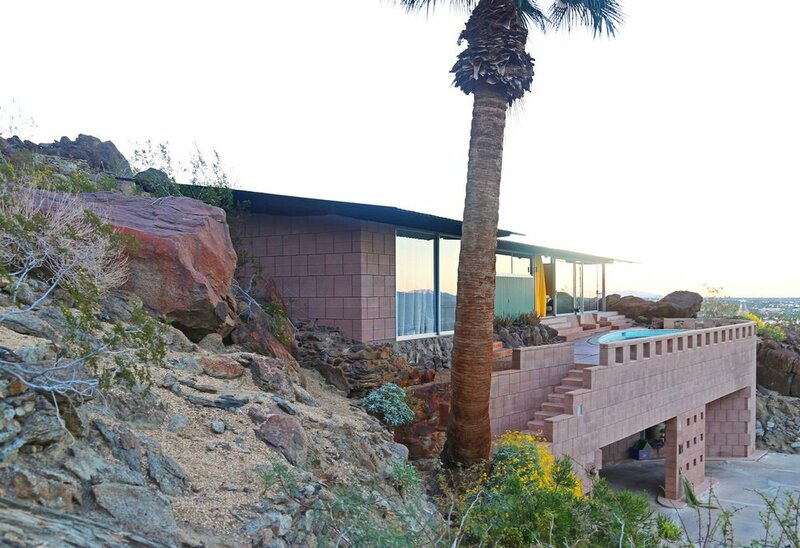 Interested in living like Mr. Palm Spring’s for a weekend? You can still visit many of the locations where Sinatra drank, ate and slept in Palm Springs! Frank Sinatra, aka “Mr. Palm Springs,” called the desert his home for more than 50 years. The Chairman of the Board and his Rat Pack buddies lived, loved and partied pretty hard here from the mid 40’s to late 1990’s. He has left imprints on the Palm Springs community that are still visible today. Check out the list below for some of Sinatra’s favorite local jaunts! Melvyn’s Restaurant & Lounge - a well known favorite, Sinatra was famous for handing out $100 bills to the waitstaff requesting that his friends drink never get below half empty. Twin Palms Estate - Sinatra’s personal residence, commissioned in the 40’s - he originally was interested in a Georgian-style mansion but was thankfully convinced otherwise - giving birth to the modern California Desert Style we know and love today. The estate can be rented out to vacationers for the true Sinatra experience. The Purple Room - One of Sinatra’s favorite bars in the town, the Purple Room was frequented by the Rat Pack during the 60’s and was well known for its party vibes with giant pictures of Sammy Davis Jr. and Sinatra adorning the walls today. Book tickets for shows, and make reservations in advance! The Purple Room is known for filling up quickly. Michael S. Wolfson Park - This small city park burrows between Frank Sinatra and DaVall drives. It was a famous oasis for Sinatra and Dinah Shore, the tiny green island near Whitewater Wash has multiple picnic benches and a single fountain in the middle and is the perfect place to find some shade and escape the desert sun. Riviera Palm Springs - Still in existence today, Sinatra used to perform benefit shows in the hotel’s ballroom alongside business pals and performers like Bing Crosby and Jerry Lewis. Lord Fletcher Inn - Boasting English fair and decor, Lord Fletcher’s was one of the singer’s favorite places to eat. You can find Frank’s traditional spot near the fireplace relatively easily—a portrait of Sinatra hangs above the chair. If you are still craving more Sinatra goodness you can visit some of his additional residences around town, The Compound, located at 70588 Frank Sinatra Drive, Rancho Mirage and Villa Maggio located at 70300 San Lorenzo Road, Mountain Center. You can also see his star on the Walk of Stars at 123 N. Palm Canyon Drive! And last but not least, don’t forget to check out the 2018 documentary, Sinatra in Palm Springs - which takes a deep dive into Sinatra’s life in our beloved city. 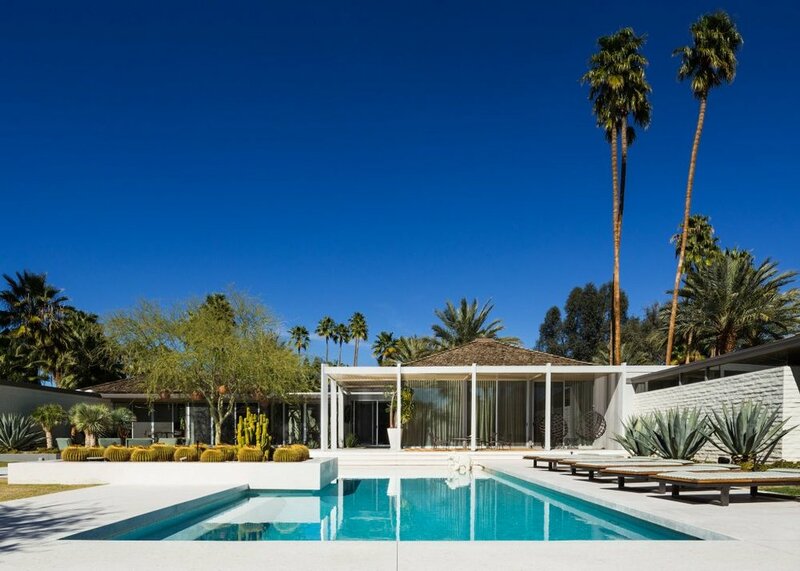 From hosting its own biannual Modernism week to inspiring shows like HGTV’s Desert Flippers, Palm Springs has become well known for its love affair with Mid-Century Modern design and for good reason. Historically, Palm Springs has attracted a huge range of stars, including Liberace, Elvis Presley, Frank Sinatra, Nat King Cole, Walt Disney, Leonardo DiCaprio and more. It’s warm weather, palm tree lined streets and close proximity to LA make it the perfect getaway for celebrities looking for some peace and quiet. The frequent celebrity visitors helped make Palm Springs fashionable during the 1950’s and attracted visitors from all over the world. Today, tourism is the leading industry in Palm Springs, generating $1 billion in tax revenues in 2017. Early celebrity visitors stayed at the Desert Inn, and El Mirador Hotel, opening in 1909 and 1927 respectively. During the 1930’s and 1940’s celebrities began building second homes in Palm Springs, creating what has lovingly become known as The Movie Colony. This tranquil neighborhood was home to Cary Grant, Dinah Shore, Van Johnson, Tony Curtis, Gloria Swanson, Jack Benny and Frank Sinatra. Today the Movie Colony is a sought - after neighborhood known for its hip, vintage-glam hotels and cozy restaurants. During the 1950’s we saw the development of the Alexander House and the Twin Palms Estates neighborhood. These developments more than doubled the housing capacity of Palm Springs over a 10 year span. The aptly named “Alexanders” were spearheaded by architect William Krisel. His use of standardized building elements, non-traditional rooflines and footprints while integrating indoor with outdoor living, made the “Alexanders” affordable, appealing and highly sought after, even today! According to the Independent, “Inspired by the stark desert landscape and modern schools like Bauhaus and the International Style, the architects of the 1950s created in Palm Springs what is now called Desert Modernism - today it's the highest concentration of mid-century modern architecture in the world.” During the mid 20th century era (1940-1970), there were several notable architects and builders who brought these concepts to life in Palm Springs including, Albert Frey, John Porter Clark , William Cody, David Wexler, E. Stewart Williams, William Krisel, John Lautner, and Richard Neutra just to name a few. Albert Frey, (October 18, 1903 – November 14, 1998) was a Swiss-born architect is largely attributed with establishing the desert modernism style that Palm Springs is known for. In partnership with John Porter Clark, some of Frey’s most famous buildings include The Cree House II, Frey House I and II, Loewy House, the Palm Springs Aerial Tramway Valley Station, Palm Springs City Hall, Salton Bay Yacht Club, and the Tramway Gas Station with its iconic flying wedge canopy at the foot of the entrance to the tramway, now used as a visitors center. Frey died in Palm Springs at the age of 95 and leaving behind a legacy and design style that has not only never left, but turned the city into the Mid-Century mecca that it’s known for today.